Britain was the world’s first industrial nation. During the 18th and 19th centuries, a complex series of interdependent factors spontaneously combined over a similar timeframe, which progressively and profoundly altered society, and the environment. They set in motion the Britain of the future: no longer a predominantly rural economy where most people scratched a subsistence living on the land, but an industrial economy where most people lived and worked in towns in return for wages. Many of Britain’s largest cities – Birmingham and Manchester, for example – were pretty much non-existent before all this happened, and much of the landscape looked very different too. Gradually, the foundations were laid for today’s, largely urban, consumer society. The complex series of interdependent factors included having an abundance of coal, iron – and water; a developing socio-political climate that facilitated the growth of a middle class of entrepreneurs, businessmen, investors and thinkers, free from the shackles of an intellectually retarded and oppressive church; a system of government based on Parliamentary law which did not necessarily favour the narrow interests of an aristocratic elite, or the whims of an autocratic monarch; innovations in agriculture, science, healthcare and transport; and the availability of growing markets at home and overseas in which to sell goods. All of these factors fed into and off one another; you could say that Britain got very lucky. Industrial growth and social development is impossible if most of the population is working its fingers to the bone simply in order to produce enough food to survive. Those circumstances allow no capacity for innovation. Traditional farming methods in Britain were labour intensive. Medieval peasants tended narrow strips of land – which could often be some distance from one another – to grow crops (evidence of medieval strip farming in modern fields is commonplace). Livestock could be grazed on common land. It had long been recognised that enclosing land was more efficient and increased production. Enclosures took place in Tudor times, but a series of Enclosure Acts from 1750 created the patchwork of fields bounded by hedges and walls that are familiar in lowland Britain nowadays. Efficiency was further increased by other innovations such as crop rotation, and increasing mechanisation – like Jethro Tull’s seed drill (1701). Enclosures and the loss of common grazing rights dispossessed many of land they had traditionally depended upon to live. And because improved agricultural methods increased production, fewer people were needed to work on the land anyway. Not only could the population be better fed, but manpower was released to do other things – including working in mines and factories, to become traders or shopkeepers – and to be consumers. People moved to towns in search of work, a massive uncontrolled migration with profound social consequences. Great advances in scientific theory and understanding had been made by giants of the renaissance such as Copernicus, Galileo and Kepler – and in 17th century Britain by Newton. Long-held beliefs were being overturned. The world was being explored, revealing more about the life it supported. Crude international travel itself bred innovation – for example, in navigation, trade and organisation. Britain had replaced its absolutist monarch with a constitutional one; anything was possible. Without the limitations of the medieval world, particularly in Protestant countries like Britain and the Netherlands, mankind could dare to believe in the power of reason. All of this contributed to technical innovation – and technical innovation facilitated industrial production. Traditionally, goods were made in people’s homes and often by skilled workers. The development of purpose-built factories led to the decline of cottage industries, the growth of the factory system and mass production. Mechanised production reduced the need for skilled workers. 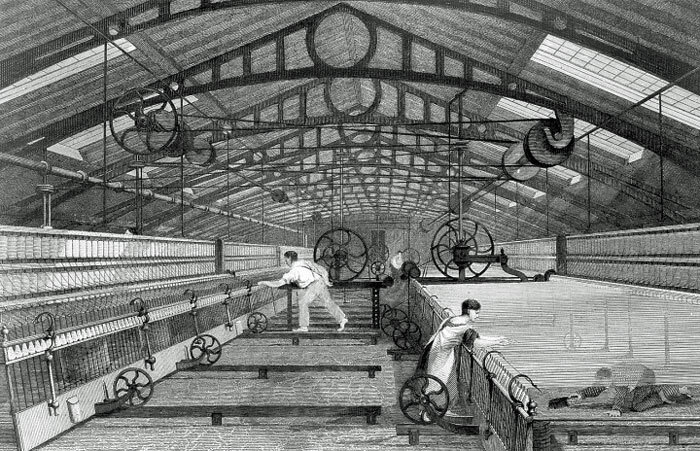 Before industrialisation, wool was king of the textiles in Britain. The first genuine factory was actually a silk throwing mill in Derby, built by Thomas Lombe in 1719. But it was the availability of American cotton (produced by slave labour) and the production of cotton goods that would be at the forefront of the factory system. In 1733, John Kay invented the ‘flying shuttle’, which enabled a weaver to double previous output. The invention of the ‘spinning jenny’ by James Hargreaves in 1764 increased the rate of spinning the threads to make the weave. The spinning jenny could still be used at home. Richard Arkwright collaborated with John Kay to produce a spinning frame, which produced a stronger thread than the spinning jenny, but which was too large to be operated by hand. Arkwright installed it at his Cromford Mill factory in Derbyshire in 1771, running it on the power of water, and where he employed some 300 people; by 1816, his workforce had more than doubled. But, by then, some factories were employing more than 1500 people – the ‘dark satanic mills’ referred to by William Blake. A further driver (pun intended) in Britain’s industrialisation was the development of the steam engine. A Devon man, Thomas Savery, patented a steam pump in 1698, but it was another native of Devon, Thomas Newcomen, who developed the first really successful piston steam engine, which was in use pumping mines from at least 1712. Then a Scottish instrument maker, James Watt, took the next crucial step. Given a model of Newcomen’s engine to repair in 1764, he realised he could make it more efficient. Setting up in partnership with Matthew Boulton in Birmingham in the 1770s, the firm of Boulton & Watt manufactured steam engines to not only pump water from tin and coal mines, but, critically, to also drive equipment in cotton, paper, flour and iron factories. Engines of the type designed by Watt were used to propel boats as early as the 1780s. The next step, the steam locomotive, came in the 19th century. Steam power would transform transport in Victorian Britain, and all over the world. But before that happened, materials still needed to be moved to and from factories, ports and markets. There were two travel options in the 18th century: overland or over water. Up to the 18th century, the responsibility for road maintenance in Britain rested mainly with local parishes – and the state of roads generally ranged from poor to impossible. From 1707, a number of ‘turnpike trusts’ were set up, combining a variety of interests (eg parishes, businessmen) to improve highways that crossed several parishes, levying tolls on those that used them. Travel by road got easier, in patches. Better construction methods in the late 18th/early 19th centuries, promoted first by Thomas Telford and then by John McAdam, helped improve matters further. Roads were definitely the preferred choice for passenger transport – thus providing the means by which people migrated and ideas and news spread more than at any time previously. But whilst roads were fine for shifting relatively small quantities of lightweight goods, sometimes fairly quickly, horse-drawn carriages could not provide an effective means of carrying bulk materials and goods to factories and markets. Water transport, on the other hand, was fine for navigable rivers near ports, but that was no good for inland transport and for easy access to coalfields. The desire over many years to make rivers more navigable created a growing momentum to construct artificial channels – canals – using large capacity barges that could be towed by horses. 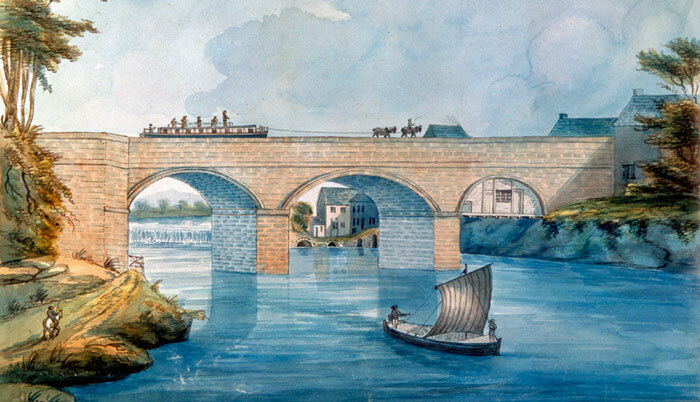 The textbook date for the opening of the canal age is 1761, when the Duke of Bridgewater’s canal connected his colliery at Worsley in Lancashire almost to Manchester, and included unprecedented engineering features such as an aqueduct and a tunnel. In fact, canals had been built in Britain before that (and the Chinese built a Grand Canal in the 7th century) but there was a spate of British canal-building between the 1760s and 1830s, creating an unplanned system of waterways which enabled raw materials to be more easily and cheaply moved to the factories that needed them, products to be more easily shipped to and from ports, and growing towns to be fed. The growth of railways from the 1830s, the biggest engineering project in Britain’s history, brought canal building to an end, though waterways continued in use as a cheaper and slower system of transport until many fell into disuse, before gaining a new lease of life as a source of leisure and recreation in the latter 20th century. 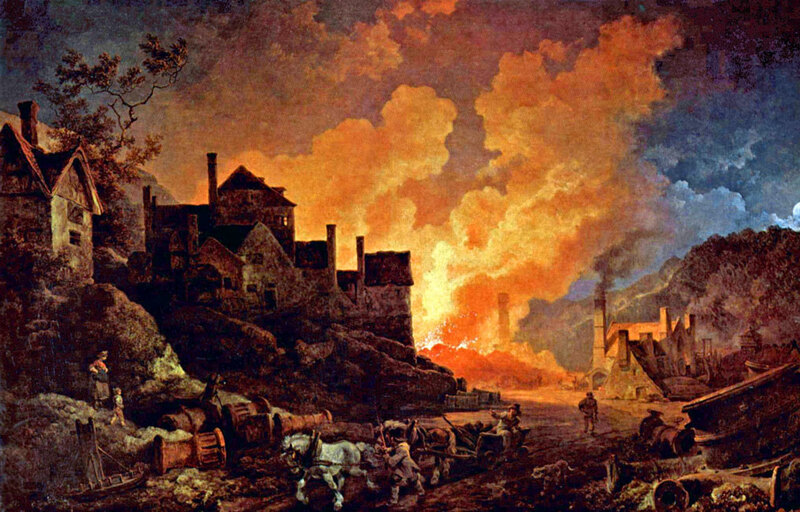 Ironworking in Britain had long been sited adjacent to sources of ore – and forests, because the smelting process required large quantities of charcoal. In 1709, Abraham Darby in Coalbrookdale, Shropshire, discovered that cast iron could be smelted using coke, a purified product of coal. Just to prove the point, in 1777-79, Darby’s grandson (also Abraham) constructed the world’s first cast-iron bridge, over the river Severn a little downstream of Coalbrookdale. 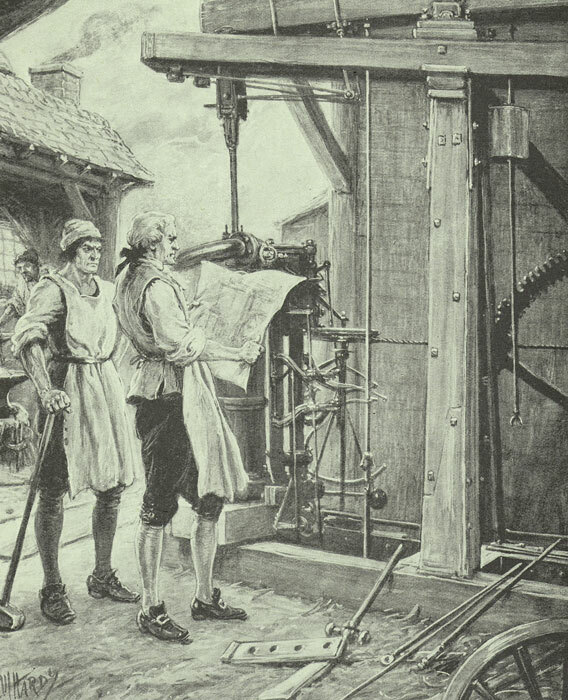 Meanwhile, in the Hampshire village of Fontley, in 1784, Henry Cort patented the puddling technique of manufacturing wrought iron, as well as introducing a rolling mill to produce bars of iron. Cort’s innovations allowed coal to be used for refining and steam power for producing bar, or rolled, iron. The iron industry, no longer dependent on charcoal or water, could be more mobile – often sited not far from sources of coal. The ability to produce large sheets of iron transformed manufacturing equipment and construction in general. The demand for iron – and steel – as well as the growth of steam power, in turn fuelled (pun intended again) the expansion of coal mining. The irony of industrialisation is that whilst it was to create amazing wealth for Britain, a developing middle class and, painfully slowly, ultimately a generally higher standard of living, its unplanned nature intensified the poverty in which most people lived whilst it was taking place. Moreover, the concentration of people living in close proximity in urban areas, usually in damp or unsanitary conditions, increased the risk of death by diseases such as typhus, cholera and, the biggest killer of all, tuberculosis. It is astonishing, then, that there was a demographic revolution too. It is estimated that the population of England and Wales in the late 17th century was about 5.5 million. By 1801 this had risen to 9 million – an increase of more than 63% in just over 100 years – plus a further 1.5 million in Scotland. By 1851, the population of Britain was 21 million – an increase of almost 83% in just 50 years (ie an average of about 190,000 additional people each year). This growth was almost entirely organic. It may have been in small part due to medical innovations, such as Edward Jenner’s discovery of vaccination against small pox in 1796, and perhaps a greater awareness of health issues and care – though the emergence of a medical profession that was more likely to cure patients than kill them was a very gradual process indeed. Even so, the death-rate fell, the birth-rate rose and there was a significant drop in infant mortality – suggesting improvements in midwifery. A greater understanding of vitamins would eventually help everyone. (British sailors were allegedly called ‘limeys’ because the Royal Navy recognised that fresh fruit prevented scurvy, a practice championed by our friend Captain Cook). Better building methods and materials would, in time, improve public health too. Britain’s industrialisation was a remarkable and continuous process through the 19th and into the 20th centuries, forging the physical and social fabric of Britain – and setting in motion the climate of constant change that we now take for granted.